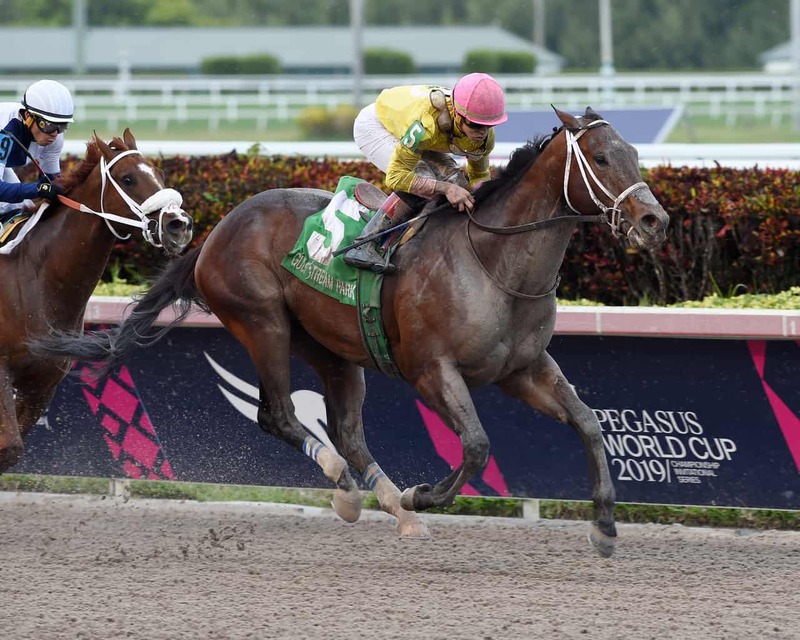 HALLANDALE BEACH, FL – Trainer Jason Servis’ Call Paul made a sweeping move in the far turn before clearing off late to capture Saturday’s Grade 3, $150,000 Swale Stakes at Gulfstream Park. Brushing the gate as he broke from post 5 as the 3/2 favorite under Irad Ortiz, Jr., Call Paul soon settled in midpack early while Country Singer posted opening fractions of :21.76 and :44.27. Beginning to advance in the far turn, Call Paul swept four-wide to the front while under only mild urging. Under a hand ride in the final 1/16 of a mile, Call Paul crossed with a 1 1/4-length advantage in a final time of 1:23.43 for the 7-furlong sprint over the fast main track. Thought unable to hold off the eventual winner in the stretch run, Zenden was able to get up for second by 2 lengths over a three-way photo finish for third. Topper T necked out High Crime and Frosted Grace for on-the-board honors, while Seismic Jolt was 5 1/4 lengths back in sixth. Chinomado, Hard Belle, Take Command, a weakened Country Singer, and a never-threatening Jackson completed the order of finish. Call Paul’s win was his second straight following a 5-length romp in the $100,000 Pennsylvania Nursery Stakes at Parx on December 1 and was also his second graded score after taking the Grade 2 Saratoga Special Stakes last summer. The 3-year-old son of Friesan Fire now carries a record of 6-4-0-2 with $366,920 earned for owners Michael Dubb, David Simon, Bethlehem Stables, and Bruce Irom. Call Paul returned $5 to win, $3.40 to place, and $2.60 to show. Zenden brought back $6.20 to place and $3.80 to show, while Topper T paid $4.20 to show.